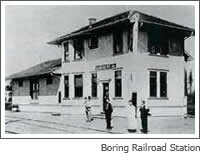 Boring was a child of the railroad. In 1900, shortly before the railroad reached Boring, there was nothing there that resembled a town. Almost everywhere the land was covered with virgin timber. If the area was referred to as Boring, it was because of the community’s first school on the homestead of W.H. Boring. But in 1901, the Portland Water Power and Railway Company built the electric interurban light railway as far as Boring. 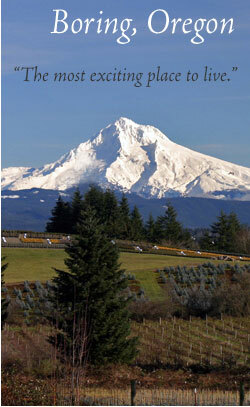 By 1903 it extended from Portland to Estacada. At first, freight was moved with steam engines, but in 1904 a wood-burning power plant was built in Boring near the present site of the Harris Stud Mill. This plant supplied the necessary energy to operate the electric trolleys which began passenger service in 1905. Before the railroad came, lumber was shipped by horse and wagon from Sandy and Boring to Troutdale’s rail line. As a result of the railroad in Boring, mills sprang up all over the area. Big-time railroad logging began. Branch roads were built. and shops common to all small towns. And a new school was built on Richey Road in 1904. The play shed, built in 1917, is presently the Country Cut-ups Square Dance Hall. Passenger service dramatically reduced travel time to Portland. A six-hour trip from Boring to Portland by horse and buggy could be accomplished in one hour by the electric trolley. Most people called them streetcars because of their similarity to Portland’s streetcars. During the summer the open air excursion trains transported people to picnic and fishing areas in Estacada and Bull Run. In 1917, a round-trip ticket to First and Alder in Portland from either Estacada or Bull Run was 75 cents. As there was no school bus service in the early 1920s, high school students walked as far as 2 ½ miles to Boring where they boarded a street car arriving in Gresham a half hour later. After school they walked the half-mile to the station to catch a streetcar back to Boring. The stations on the interurban were approximately one mile apart. All were sheltered and had benches. A few of the stations had freight houses, and Boring and Gresham had station agents. Starting in the 1920’s when more people began to buy automobiles fueled with 19-cent-a-gallon gasoline, they found it more convenient and more economical to drive. Bowing to the automobile, the electric interurban eliminated all passenger and mail service to Boring in the mid-1930s, though service to Gresham continued until World War II. In some places the track has vanished. The Max light rail system now covers the 15 miles from Portland to Gresham in 40 minutes. In 1905, the 17-mile trip from Gresham to downtown Portland via the old electric urban trolley took 50 minutes. Today the rail line between Boring and Portland is the Springwater Trail, which is enjoyed by bikers, hikers, and horseback riders.